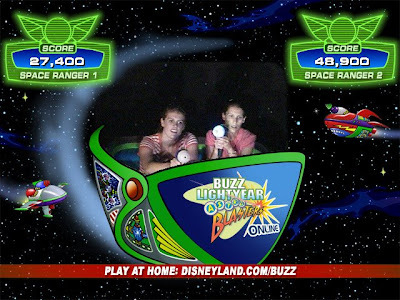 Buzz Lightyear, Astro Blasters! Last time we went to Disneyland with Alex and Megan, I spent the entire ride shooting Chris and the girls. It wasn't until the end of the ride that I realized that you're supposed to shoot the passing targets. This time I buckled down and got to work. Despite my renewed efforts, Bob proved to be the more competent toy laser marksman and was our overall winner. We had a fantastic time at Disneyland and California Adventure Park today, although Chris was sorely missed. Alex and I teamed up to conquer Space Mountain and the Tower of Terror. The four of us agreed that we especially liked Grizzly Mountain (I got soaked), the Soar over California ride, and (Chris' all time favorite) Thunder Mountain. The lines were short, the weather was perfect, and we managed to avoid getting mobbed by teeny boppers attending the evening Miley Cyrus concert. A truly lovely day. Thanks for coming to visit us Bob, Cherie, and Alex. We are looking forward to Thanksgiving!